The 26th IHF men’s World Championships is getting to the medal phase quickly, with competition continuing this week in the second group phase to determine the semifinalists. The tournament has been a big success so far in the first two-country hosting of the event, with games in Germany and Denmark. ● Group A: 1. France, 9 points (4-0-1); 2. Germany, 8 (3-0-2); 3. Brazil, 6 (3-2-0); 4. Rissia, 4 (1-2-2); 5. Serbia, 3 (1-3-1); 6. Korea, 0 (0-5-0). ● Group B: 1. Croatia, 10 (5-0-0); 2. Spain, 8 (4-1-0); 3. Iceland, 6 (3-2-0); 4. Macedonia, 4 (2-3-0); 5. Bahrain, 2 (1-4-0); 6. Japan, 0 (0-5-0). ● Group C: 1. Denmark, 10 (5-0-0); 2. Norway, 8 (4-1-0); 3. Tunisia, 6 (3-2-0); 4. Chile, 4 (2-3-0); 5. Austria, 2 (1-4-0); 6. Saudi Arabia, 0 (0-5-0). ● Group D: 1. Sweden, 10 (5-0-0); 2. Hungary, 6 (2-1-2); 3. Egypt, 5 (2-2-1); 4. Qatar, 4 (2-3-0); 5. Argentina, 3 (1-3-1); 6. Angola, 0 (1-4-0). ● Group 1: 1. France, 7 (3-0-1); 2. Germany, 5 (2-0-1); 3. Croatia, 4 (2-1-0); 4. Spain, 2 (1-2-0); 5. Brazil, 2 (1-2-0); 6. Iceland, 0 (0-4-0). ● Group 2: 1. Denmark, 6 (3-0-0); 2. Sweden, 6 (3-0-0); 3. Norway, 4 (2-1-0); 4. Hungary, 3 (1-2-1); 5. Egypt, 1 (0-2-1); 6. Tunisia, 0 (0-4-0). 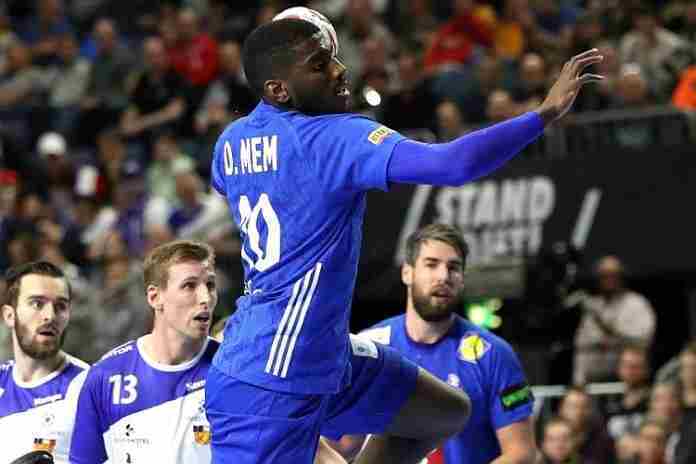 While France and Germany are still undefeated, but have ties, Sweden and Denmark are perfect and will play the final game of the second group phase on 23 January, but both may have already locked up semifinal berths by then. The semifinals will be played on 25 January in Hamburg (GER), and the medal matches on the 27th in Herning (DEN). The top scorers so far have been Macedonia’s Kiril Lazarov with 48; Youssef Benali (QAT) and Erwin Feuchtmann (CHI) with 46; Mikael Hansen (DEN) with 42, and Qatar’s Frankis Marzo with 39. Look for match results and standings here.